Going into the movie, my expectation was that I’d be watching Transformers versus Godzilla, to put it all in a nutshell. I’m a simple guy and I like to simplify things, so this seemed to be an apt short-short description of the movie to me. As far as branding actually goes, its not too far off the mark. The kaiju monsters in the movie are all of that same monster scale and that particular genre is HUGE in Japan. And given the recent successes of Michael Bay’s Transformers franchise, not to mention the trailer scenes that we saw, the Jaegers are quite analogous to the sentient Autobots and Decepticons. But the thing is, the movie is so much more. And it has absolutely no relevance to Transformers despite a superficial resemblance. First off, I’ll say that the acting in the movie is decent. Its not great, its quite cheesy with obvious moments, and the film won’t really be winning any awards in that department. Still, I enjoyed the performances by Charlie Hunnam, Idris Elba, Rinko Kikuchi, and the others. There was a simple earnestness to their characters and the actors all performed well in regards to that. The more I saw of them, the more I wanted to see. Because what it all boils down to is that the movie doesn’t set out to wow you with “OMG HE WAS AMAZING/GOOD HEAVENS SHE BLOODY WELL ROCKED THAT ROLE, ACADEMY AWARD HERE SHE COMES” or something like that. The simplicity of the characters, and their uncomplicated arcs mean that the film is a humble one. It makes no pretensions to be more than it is. And what it is at heart is a callback to two cult-classic genres, bringing them together for a new audience, a new era. Could Hunnam’s Raleigh Beckett and Kikuchi’s Mako Mori have been performed better? Sure. By that same measure, they could have been written better as well. There were times when things seemed too obvious, and too on the nose for me to really get a thrill out of it. Then again, I didn’t go into the movie expecting to be as wowed as Heath Ledger’s performance as Joker in The Dark Knight, Christopher Nolan’s second Batman movie. I knew already that the movie wouldn’t be too big on the story, and it isn’t. But here’s the kicker: the movie is an absolutely mind-boggling visual treat. 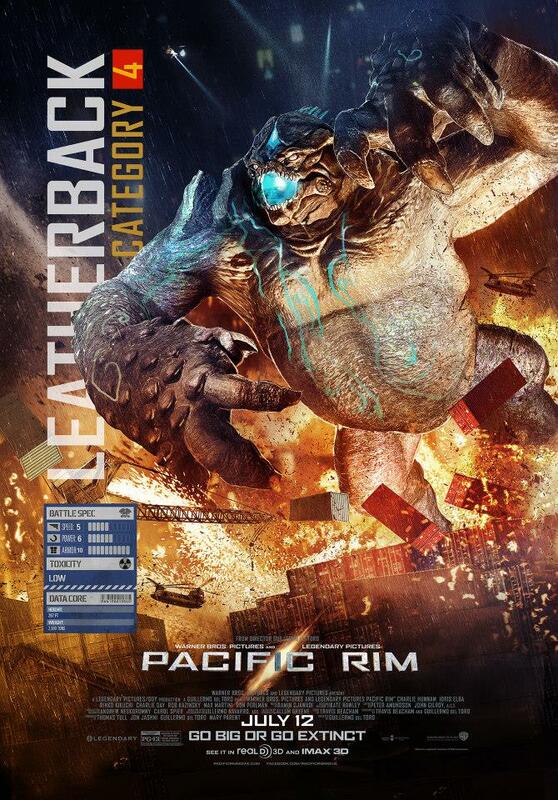 From the visions of when the first kaiju arrives in San Francisco to all the one-on-ones between the Jaeger mechs and other kaiju, the film constantly ups its game to present some solid action scenes. And that’s not all. I came across this post (be warned, there be spoilers there!) a couple weeks back that highlights all the little visual easter eggs that are in the film. Frankly, this blew my mind. A lot of the things that the writer points out show just how deeply attentive the movie is to its own characters and events. As the author says, the visual brilliance of the movie is just astounding. Kikuchi’s Mako comes off as weak and submissive at times, and this bothered me because I was seeing the movie through eyes that have become sensitive to such things of late, thanks to an exposure in written fiction and a growing discussion within the publishing industry. And that in itself bothered me too. I wasn’t able to enjoy the movie as much as I wanted to because I couldn’t help feeling that the only female character of importance in the movie had to bow down to the male characters. But something stuck with me, a dialogue from Mako when she is talking with Raleigh (I paraphrase): “Its not weakness, Mr. Becket, its respect”. And that got me thinking about her cultural background and how respect is a deeply ingrained aspect of Japanese culture, especially towards mentors and heads of the family. For Mako, who lost her parents as a child to a kaiju attack and was saved (somewhat indirectly) by Elba’s Stacker Pentecost single-piloting a Jaeger, Pentecost is both her mentor – her sensei – and a father figure. Its easy to dismiss something like this out of hand, especially with cynicism on call, but that doesn’t (shouldn’t) mean that story concepts like this are not a good way to build character. 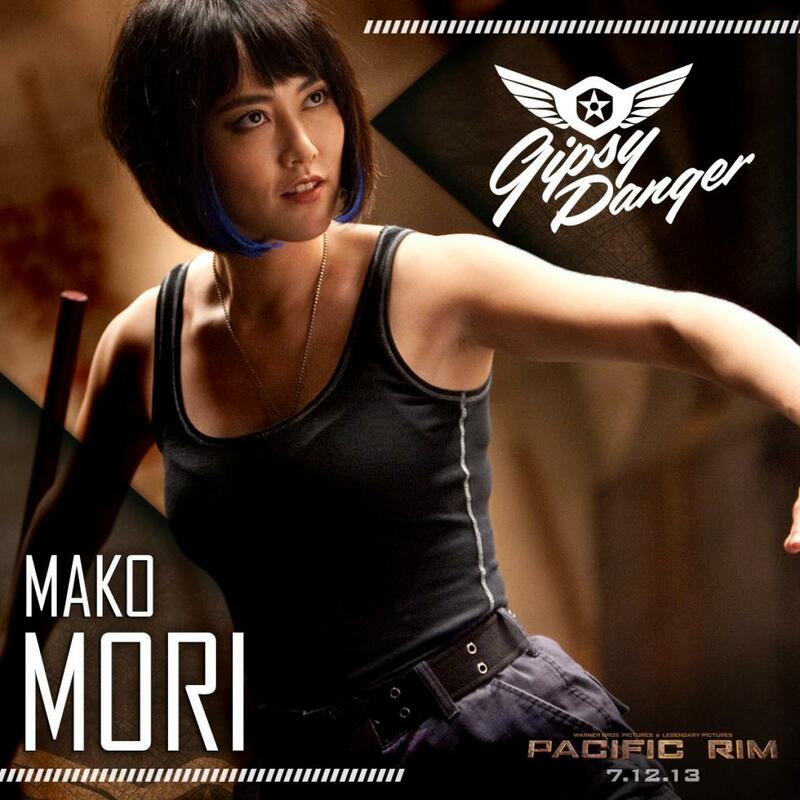 After all, Mako is a non-sexualised female character in a big budget action movie. That doesn’t happen often. She is in an emotionally unstable place, but she shows ample signs of fighting against it, to make her voice heard even if she has to accept whatever form of censure in the end. That realisation rocketed Mako up my list of favourite female movie characters. And Kikuchi’s performance was just excellent. And the same kind of realisation affected how I saw Hunnam’s Beckett and Elba’s Pentecost. These are simple characters on the surface, characters who walk right off the tropes-list of the genre, but these are also characters I could relate to and become invested in, precisely because they weren’t complicated beings I struggled to understand them. I understood them from the get go and I got invested in their struggles. Beckett’s sheer determination after suffering his biggest loss early on in the movie, and him bouncing back despite that when called to, that has a heroic charm I can get behind. 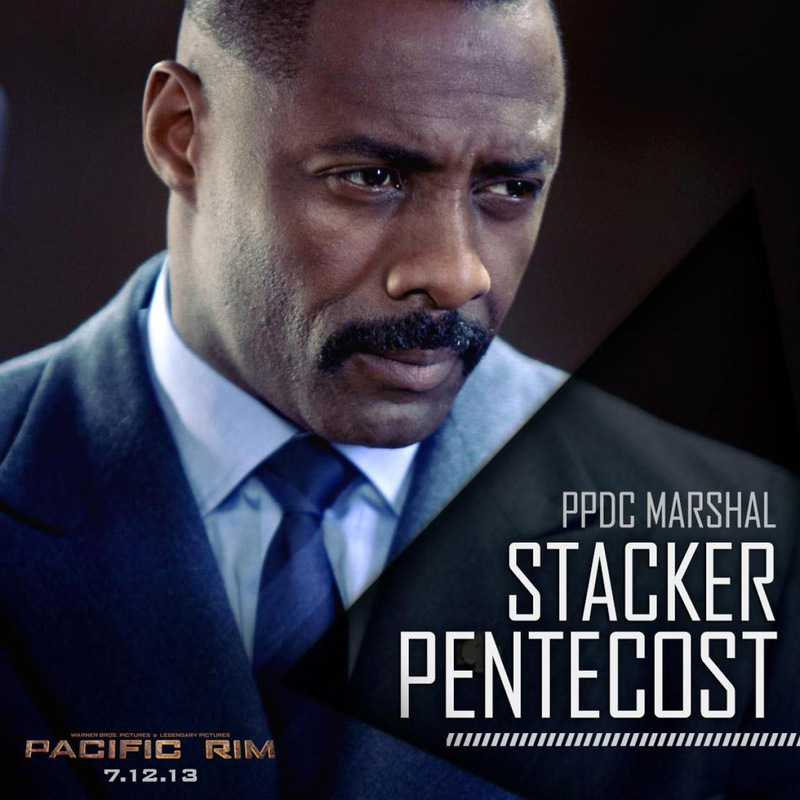 Pentecost’s notion of self-sacrifice, his sense of duty, his vulnerabilities as a commander and a foster father, they were elements of his character I could support and root for. Pentecost, Beckett and Mori are a trifecta of characters who succeed in a movie that is both plot and character driven. As a fan of mecha anime like the Gundam franchise, Tengen Toppa Gurren Lagann, Neon Genesis Evangelion etc, I loved del Toro’s Jaegers. In mecha anime there’s always the theme that the mecha is a character of its own, that no two mechas are the same as each other. Pacific Rim goes to great lengths to show the diversity between the Jaegers. 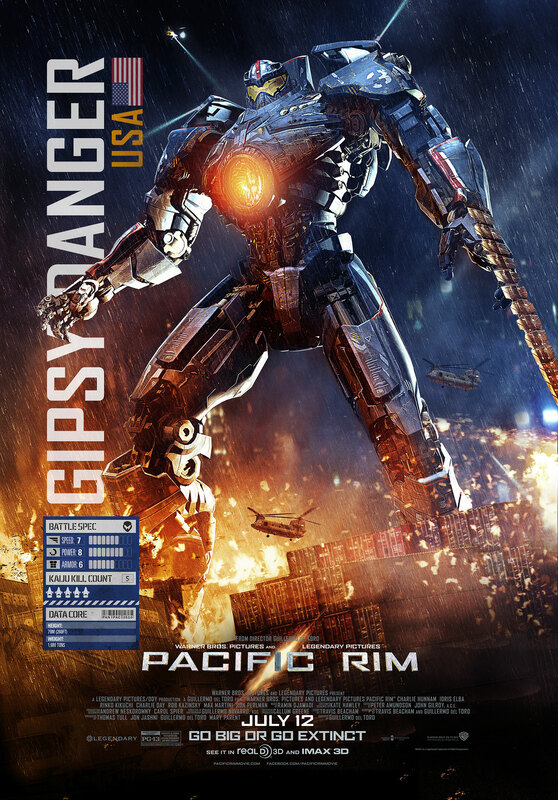 We have Beckett and Mori’s Gipsy Danger, which is the oldest generation Jaeger in the film, IIRC. We have the Striker Eureka, the newest generation Jaeger piloted by Pentecost’s top two pilots. We have the Cherno Alpha, a Russian Jaeger piloted by a wife-and-husband team who are badass cool in all of their scenes. We have the Crimson Typhoon, piloted by Chinese triplets. Its lamentable that Crimson Typhoon and Cherno Alpha get very little screen time, because their pilots and the Jaeger concepts were just fantastic, but del Toro more than makes up for that fact with Striker Eureka and Gipsy Danger. Of course, the latter is the “protagonist” as well, so that gets it a hell of a lot more screen time. Each Jaeger has a completely different visual design, completely different fighting style, and a completely different character. I love what del Toro and his production design team did with the Jaegers and the kaiju, giving visual life to so much diversity. You only need to look at del Toro’s comments on the kaiju design to see how much inspiration he’s drawn from all over the place while still being creative and unique. I saw the movie in 3D and as someone who is on the fence about that piece of cinema technology, I’ll say that I enjoyed it. This was a movie that deserved 3D treatment and the entire team has done well by it. As is my practice, I regularly take off my 3D glasses during a movie to see how it all looks without them, and Pacific Rim never disappointed. There was always a clear and recognisable 3D effect. If anything, the 3D glasses that the cinema hall provided us (I went with my cousins) were of a low quality and were darker than 3D glasses normally are. Watching a Jaeger sucker punch a kaiju was one of the most memorable events in the movie. Or in Hong Kong during the big battle when Gipsy Danger smacks a kaiju with an oil tanker, bringing it down on its head like a warhammer. Fantastic stuff. Visually, the movie is an absolute delight. All the different kaiju doing their own thing, the different Jaegers doing their own thing, and it all comes together perfectly. Where movies like G.I.Joe: Retaliation, Iron Man 3 and Star Trek 2: Into Darkness failed to wow me with their visual “brilliance”, Pacific Rim succeeds in spades. This movie should be a true blockbuster. 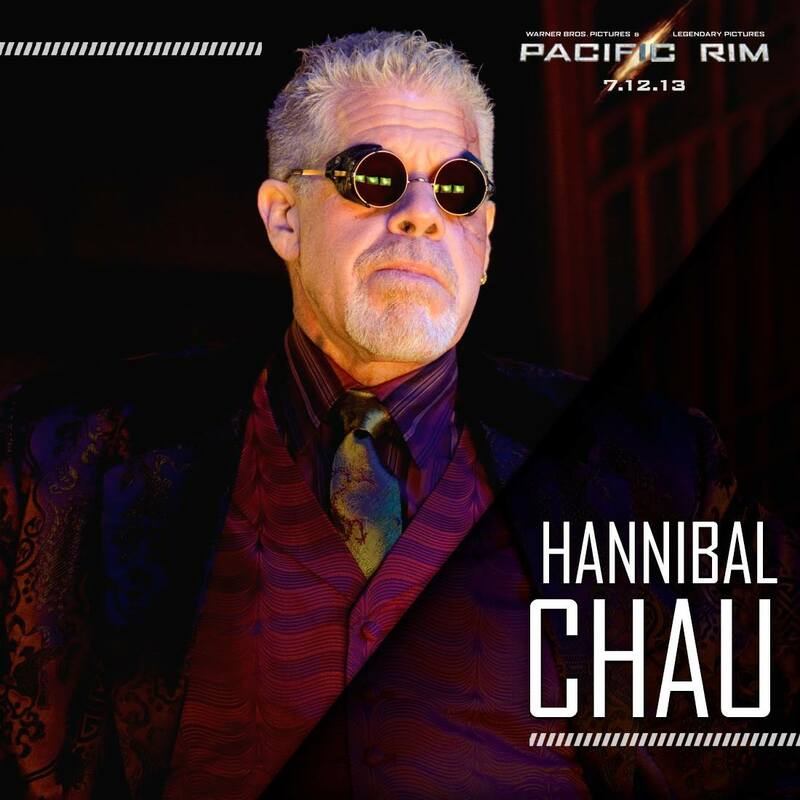 Oh and the stealer performance of the movie definitely goes to Ron Perlman’s Hannibal Chau, a top-of-the-pack kaiju black marketeer. Perlman was absolutely fantastic in this cameo-ish role. He steals the scenes he is in with Charlie Day’s Newton Geizler, one of the scientists that Elba’s Pentecost brings in to the Shatterdome Base in Hong Kong. I loved his interactions with Day’s character and Perlman shows that he can rock a character like Hannibal Chau, named after the character’s favourite historical figure (Hannibal) and his second-favourite Szechuan restaurant in Brooklyn (Chau). Together with Day, Perlman provides some much needed and much welcome levity to the film, and also shows off a really badass side to Chau’s character. Just… amazing. I have three primary criticisms for the movie. They didn’t impact my enjoyment too much, but they did jump out at me as elements that could have been improved upon. The first of these is that almost all the action scenes take place at night. As del Toro himself has stated, he was going for a high-concept, operatic, grand adventure feel for the film, and the night battles to contribute to that significantly, but I would have loved to have seen a daytime battle between the Jaegers and the kaiju. There’s a certain… heroic effect that is taken away from the night scenes because of that timing. Sure, the kaiju are the monsters of the darkness, striking from the deepest shadows of the world, but the Jaegers are the defenders of the light, striking from sanctuaries of hope and promise. Would have been great. The second criticism is that the very ending of the movie takes away from the entire sacrifice theme that’s playing. And it rests the power of agency fully in Beckett’s hands rather than Mori’s, who should have at least been allowed to have a say in matters. These final seven to eight minutes are the only time in the film when I felt letdown by the story. I was expecting something completely different, and the movie was certainly hinting along those directions, but then that didn’t happen. The one plus point for the ending is that del Toro stayed well clear off the James Bond-esque or typical action movie trope of the guy getting the girl and them making out. Finally, the movie breaks some of its own pseudo-science rules for the climax. The things that are explained don’t jive so well with actions taken by the Gipsy Danger crew towards the end, or just with the entire Jaeger program in general, and this bothered me. I’ve talked with several people about this and I haven’t gotten a satisfactory explanation for it yet. This ties into the previous criticism, into how the ending is portrayed. It was an unexpected direction for a… bleak (?) movie such as Pacific Rim to take and so I’m not wholly convinced by it. As a final comment, I want to say that the most lamentable of facts is how the American audience has treated del Toro’s latest. People flock in droves to see movies like G.I.Joe: Retaliation, Iron Man 3, Die Hard 5: A Good Day To Die Hard and Star Trek 2: Into Darkness, but they stay away from movies like Pacific Rim. And the American media engages in a process to bring down the movie even before it is released. Frankly, it is quite disgusting that in Pacific Rim’s release week, Adam Sandler’s stupid ensemble sequel Grown Ups 2 was the top movie of the week. The sequel and reboot mentality is killing Hollywood right now. And this entire fiasco is proof of that. Is it any surprise that the international audience has taken to the movie so enthusiastically when compared to the American audience? Nearly 70% of the movie’s box receipts are from international box office sales and the movie broke records in China, the biggest single-country international market outside of the US. Disappointing. For my money’s worth, Pacific Rim was an excellent offering and I hope that del Toro gets the chance to make the sequel. I would love to see it. Posted on August 10, 2013, in Movie Reviews, Review Central and tagged Charlie Hunnam, Idris Elba, Jaeger, Kaiju, Mecha Anime, Monsters, Movie Reviews, Pacific Rim, Review, Review Central, Rinko Kikuchi, Ron Perlman, Science Fiction. Bookmark the permalink. 8 Comments. I would like to see a sequel too. Maybe the aliens find a way to open the portal again? Good review as always, sir! I liked the movie a hell of a lot, as you know – and found Rinko Kikuchi to be the performer of the film. I think she did an awesome job with a character that does, initially, seem weak but turns out to be an awful lot stronger than you think as the movie progresses. Hunnam doesn’t do much for me, tbh – but the weakness of his performance here is at least in part the fault of a fairly hackneyed character arc and some weak dialogue. That said, the film as a whole is a fantastic experience and, like virtually everyone else I know, I’d definitely pay to go and see a sequel.